﻿ Inner Mongolia Eerguna: the most beautiful wetland in China. When you visit the endless prairie wetlands, the scenery will inevitably seem monotonous. The most marvelous Erguna wetland lies in the flowing river. Its water makes the picture appear graceful and magnificent. Eergu'Na wetland in Inner Mongolia is the most original and largest in China today. It is also known as the first wetland in Asia." 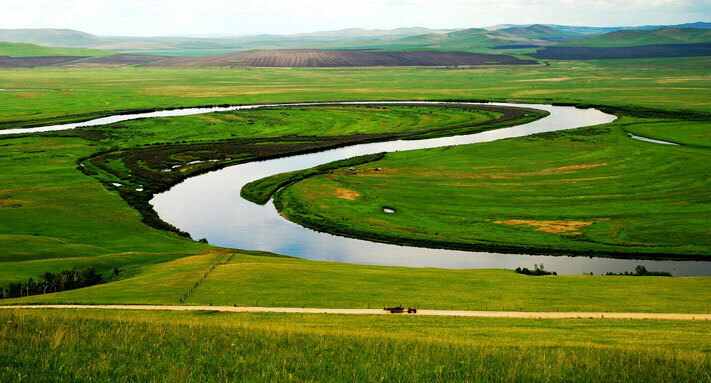 The terrain is gentle and open, the Ergun River tributaries flows through this wetland, forming a spectacular river wetland landscape, which is considered the most attractive to many photographers. Especially in autumn, birch turns yellow and from afar appears like a piece of golden earth. Clear water flows quietly, surrounded by flowing rivers, Shore Bushes bushes, has a strong contrast to the yellow birch, along the front part of the wetland, rivers flowing in the middle of the wetland. The venue for the beautiful reflecting incisively and vividly, no matter where you are going, regardless of the changes in depth, forest, river flow, blue sky, white clouds always follow the footsteps, without missing the line of sight, relaxed and happy.